Diamond Parcel Papers - - Leather Parcel Box. Top » Sundries » Diamond Parcel Papers » (DIA-130.00) Leather Parcel Box. 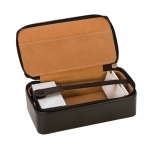 Leather box is an ideal way to hold your stones. More eye-appealing for in-store use than a wallet. Great for storage in a safe, too. Inside measures 3-1/2" x 6-1/2".